Last week I did something scary: I ordered a curtain online. So what!? you say, people order stuff online everyday. While this is true, and I have ordered dozens of things, including curtains, online in the past, this time was different: I was looking for a curtain to match the other curtains we already had and I had long since thrown out the piece of paper with the brand information and color. Now you’re going to ask why we didn’t just buy enough curtains when we bought the others. Actually, we did. At the time we were buying curtains Bed Bath & Beyond didn’t have the shorter length in the store, and we didn’t feel like having it ordered. There are three windows and we purchased three curtains. 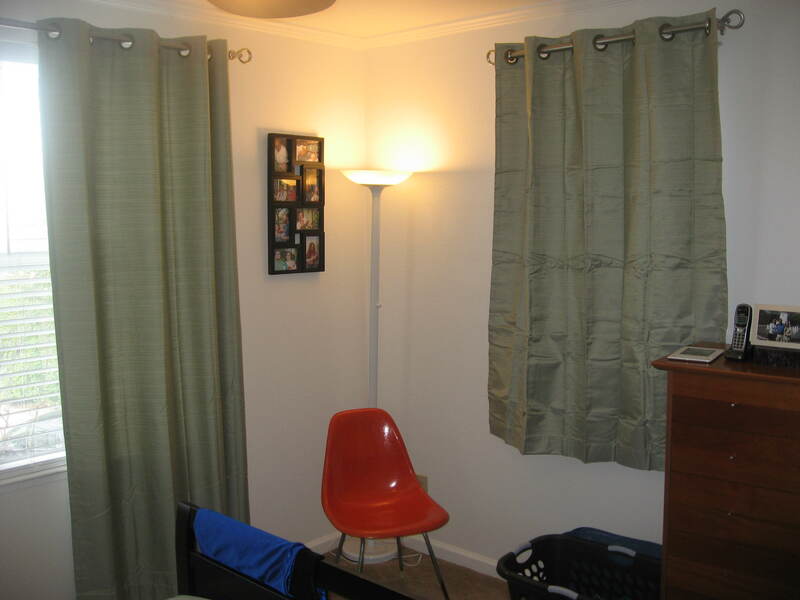 Three full-panel curtains that skim the top of our baseboards. They looked great on two of our three windows, on the third, smaller, window, it just looked sort of odd. The third, long, curtain went over our closet door, the actual door is in the garage. Don’t question the logic here, it works well for us. It has been nearly a year since we installed the first set of curtains so we decided it was probably time to get a shorter fourth one for the small window. We looked in stores, they were nowhere to be found, instead we found the curtain rods we’d used for O’s room on clearance so we got some for 2.0’s room and the office. Then I turned to the internet. All I knew was the curtains were thermal, which helped narrow it down on the BB&B website. Then I took a few, wildly somewhat educated guesses, and ordered. Yes, I picked curtains based on a sketchy, pixelated image, in a color that only looked a vague somewhat similar to the curtains in the bedroom, and when they arrived today, they were a perfect match. Fabulous! I’m so happy for you! Once the wrinkles hang out it’ll be perfect.